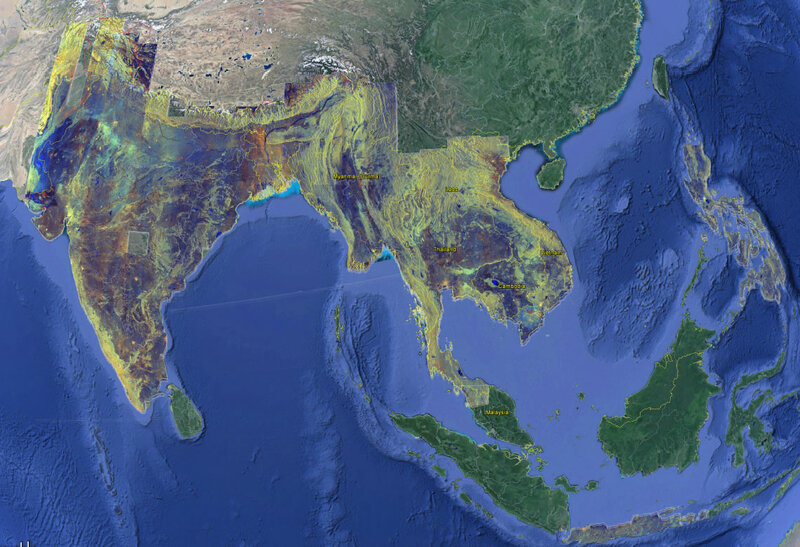 The Sentinel-1A mosaic stretches from Pakistan to the Philippines, with green areas showing vegetation, including rice (SAR imagery from ESA: Sentinel-1A © Copernicus data (2015). Background from Google Earth © Google Inc. Sentinel 1A mosaic created by sarmap and IRRI using Mapscape-RICE). For half a decade, IRRI and sarmap have been partners in research and development of rice monitoring and forecasting services, not just during disasters, but all year round. These services are enabled by cutting-edge satellite technology, building on proprietary technologies and the joint global expertise of the two organizations. Ongoing programs regularly generate rice area and yield information in Cambodia, Indonesia, India, Philippines, Thailand, and Vietnam. This information is shared with key stakeholders in those countries with a view to apply it in disaster response and risk management applications for food security, such as crop insurance. A recently signed Framework Agreement between IRRI and sarmap further institutionalizes their collaboration to provide accurate, timely, and detailed information to decision makers in the public and private sectors on rice crops and rice-related water supply; predict regional and local yield and production; and provide assessment of disaster impact on rice area. “We now want to scale up our remote sensing-based rice area-yield monitoring service”, explains Francesco Holecz, co-Founder and CEO of sarmap. “This agreement institutionalizes the joint work that we have carried out over the last five years. This cooperation spurs us to step up our research and apply its results for public or private clients in Asia and beyond”. IRRI is the world’s premier rice research institute based in the Philippines. It is an independent, nonprofit organization dedicated to reducing poverty and hunger through rice science. sarmap is a Swiss company providing operational innovative Earth Observation based solutions for land applications. These organizations have been working together through the Remote sensing-based Information and Insurance for Crops in Emerging economies (RIICE) and the Philippine Rice Information System (PRISM) projects to make rice information available to policymakers and other stakeholders. The RIICE project, funded by the Swiss Agency for Development and Cooperation, is a collaboration among IRRI, sarmap, Allianz, and GIZ, while PRISM is a joint project by the Philippine Department of Agriculture, Philippine Rice Research Institute, IRRI, and sarmap. Through these projects, sarmap and IRRI successfully developed and deployed a mechanism that monitors rice-growing areas, makes mid-season yield forecasts, and estimates end-of-season yield at more than 85% accuracy at district level. Recently, Philippine Agriculture Secretary Proceso Alcala sought the assistance of PRISM in assessing rice fields struck by Typhoon Lando (international name: Koppu) based on analysis of satellite images acquired over Central Luzon, Philippines.